Have you ever looked up at the stars on a clear Winter night and noticed a faint but bright fuzzy patch, somewhere near Orion? Unmistakeably a glowing thing, but not the pinpoint of light like a regular star. You might have rubbed your eyes or wondered…what IS that cloudy starry thing? Well that would be the Pleiades – also known as the Seven Sisters. Officially part of the constellation Taurus. 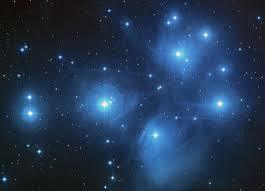 The Pleiades are one of the nearest star clusters to us here on planet Earth. A star cluster being simply a group of stars, bound together by gravity. The Pleiades are an open cluster – which means they’re all relatively young stars. These types of clusters are only found in spiral galaxies, like ours, the Milky Way. To find the Pleiades, follow the line of Orion’s belt up, through red-looking star Aldebaran (the main star in Taurus, and easy to spot as it’s a bright one). Keep going in pretty much a straight line and you’ll reach your cluster destination. This is much easier to master with the naked eye. Once you’ve found it, then grab your binoculars and point them in the area you were just looking! The Pleiades are a fuzzy mystery with the naked eye but through binoculars are a real treat – you can clearly make out the 7 brightest stars, and many, many more. Grab any pair you can find and give it a go – you won’t be disappointed. You might need to scout around a bit to locate the cluster but once you’ve found it, it’s unmistakeable. With the naked eye, if you want to make sure you’ve found it, just direct your eyes’ focus ever so slightly to one side of the fuzzy patch. Funnily enough it will look clearer – that’s because the edge of our vision is more sensitive to subtle light, because the majority of our light-sensing rod cells are located in the peripheral retina. The opposite is true for colour though, so don’t be attempt this technique when trying to be sure that you’re looking at red planet Mars! Enough of the eye science. Back to the Pleiades. In mythology, the Pleiades are the seven divine sisters – supposedly very attractive ones at that – daughters of the titan Atlas and the sea-nymph Pleione, hence Pleiades. However it’s thought that the name of the cluster actually comes from the Ancient Greek plein, meaning to sail, as the appearance of the star group in the sky marked the beginning of the Greek sailing and navigation season. Interesting fact for those – like us on Scilly – reliant on boating! Here and now, the Pleiades dropping lower in our sky is more likely to indicate the start of our tourist season. Winter having been fairly rubbish all round for stargazing, we’re hoping to spend more time up at the Observatory as Spring comes along. Anyway, grab a look at the wondrous Pleiades while you can – stay hopeful for a patch of clear sky! Last Friday, I shared a few star facts with the Reception class (aka Toppers) of the Five Islands Academy, at the Carn Gwaval base on St. Mary's. They have been looking at fun things to do at night time - obviously stargazing needs to be on the list! 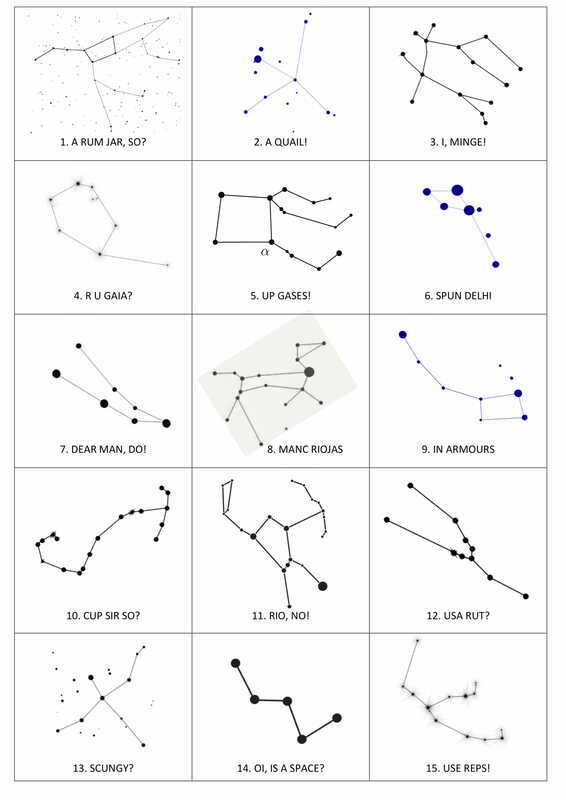 We looked at the Plough and Orion, and completed dot-to-dot puzzles of these. We also learned the words ‘astronomer’ and 'constellation'. 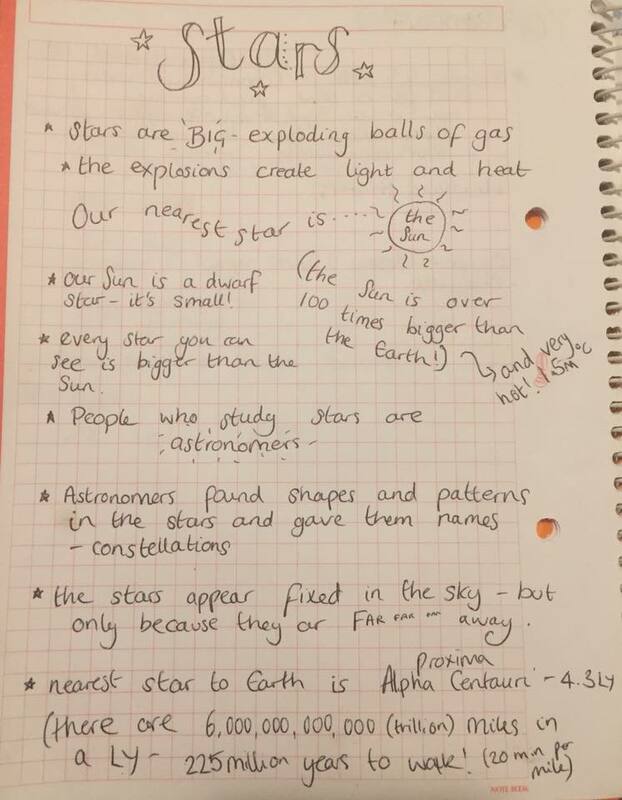 Their homework was to find Orion’s belt! I can't wait to hear how they got on. This piece was originally broadcast on Radio Scilly in January 2019. ​Orion is one of the gems of the Winter sky. Right now, this unmistakeable constellation, famous for its ‘belt’ of 3 stars in a row, lies due south in the sky and is clearly visible as soon as it’s decently dark. As I speak, that’s roughly 6.30/7pm. 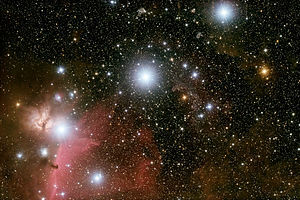 Orion’s a really rewarding constellation for beginners and experts alike, as it has lots of items of interest. Orion was a hunter in Greek mythology, a rather good one, as he managed to place Zeus (king of the gods) in the sky, as the constellation Orion. 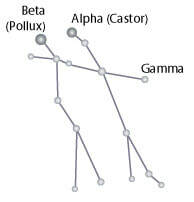 To find our hunter in the sky, look south and find the constellation with its 4 corners and distinctive 3-star belt. As you’re looking at it, the top left and bottom right of the 4 corners are interesting to observe. The top left, Betelgeuse, is a red giant star nearing the end of its life; you can clearly see it has any orangey hue, almost (but not quite) to rival that of Mars. Contrast Betelgeuse with the blue tint of the bottom-right star of Orion; Rigel (or, if you must, Rigel just like Nigel) is a blue supergiant and the 6th brightest star in the night sky. 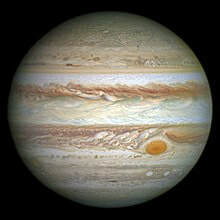 Look directly at the stars to get the best of their colour; for even more pronounced viewing, grab a pair of binoculars. The great Orion Nebula hangs below Orion’s belt. It can clearly be recognised with the naked eye as something other than a star…something more…nebulous. It’s a place – in our Milky Way – where stars are born: literally. It is a stellar nursery. Stick your binoculars – or even a modest telescope – in that direction, and you’re in for a treat. Orion is the centrepiece object of the Campaign for Rural England’s Star Count 2019, running throughout February, designed to survey the darkness (or lack thereof) of England’s night skies. Find – again, the 4 corner stars of Orion; these will give you a rectangle. Allow your eyes to adjust for, say, 15 minutes. Now, with the naked eye, how many stars can you count within that rectangle? You can’t count the 4 corners but you can count the 3 in the belt. To give you an idea, if you can count less than 10, you’re somewhere rather light polluted. If you can count more than 30, you’re looking at truly dark skies! In the Campaign for Rural England’s recent Night Blight report, Scilly was recorded to have the darkest skies of anywhere in the UK – and long may that continue. So get out there and prove it. Finally, the Observatory on St Martins will be officially open to the public from 1 April. We’ll be shortly publishing our schedule of events for the season shortly. In the meantime, if you want to find out more or have a look around, do get in touch. 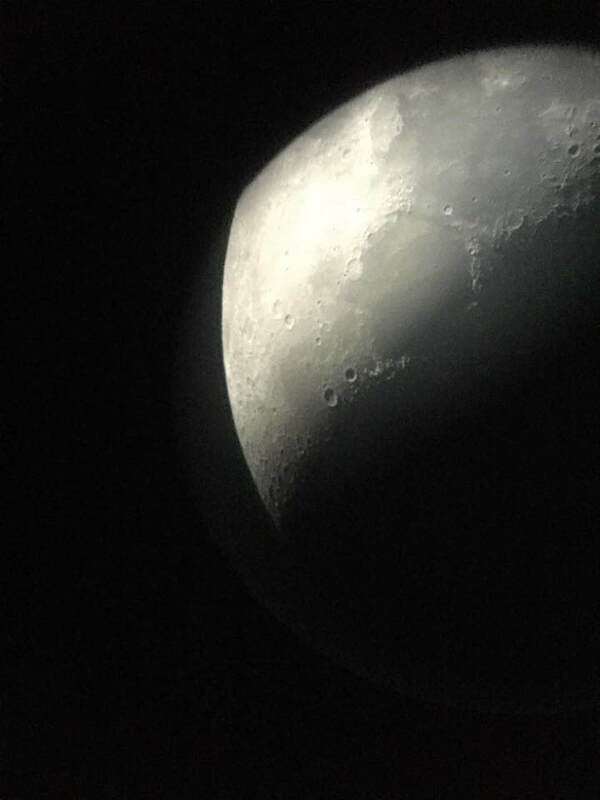 We had our first go on the observatory’s 14 inch Meade telescope on Saturday night. It’s not fully set up but the Moon was out (behind a light screen of mist). We thought we may as well have a go. And we weren’t disappointed – it was, quite simply, phenomenal. Magnificent as it is, you don’t really need a big old telescope to view the Moon. It’s only 385 thousand-ish kilometres away, which is practically next door, in the grand scheme of space. Binoculars will give you a real reward. You will easily see that the moon’s surface has plains, craters and mountains. Through a small telescope, you start to make out detail in textures and contours, spotting the smaller, shallower craters. This is where you might want a map to start finding your way around! You can’t get many places without consulting a map here on Earth and so it’s the same with the Moon. Find yourself a Moon map – there are several online – and this will help you to identify various features. The Lunar Maria – or Seas of the Moon are a complete misnomer, because they’re actually bone dry. They were once thought to be seas, the dark patches mistaken for water. They were given poetic names like the ‘Sea of Serenity’, ‘Sea of Tranquility’. We now know that these aren’t seas, but are flat plains of lava, however the fancy names have stuck. Believe it or not, Full Moon is the worst time to observe the moon (after New Moon, obviously). It’s so bright that you won’t be able to make out great detail. The best time to view our lunar neighbour is as it’s waxing or waning, ideally in the days following the first quarter – i.e. NOW! Your best place to look is along the line of darkness – known as the terminator (nothing to do with Arnold Schwarzenegger). As the terminator recedes, features near the border stand out in bold relief; that means that shadows become stronger and details are more easily seen. So, grab a map and get looking up at the moon – it has a lot to offer, none of it cheese.